ABB SafeLine enclosed non-fusible disconnect switches are designed to meet customer requirements in terms of safety, ease of installation, space savings and operational convenience. They are available in a wide range of amperage ratings, are UL approved and NEMA rated to satisfy rugged industrial environments. 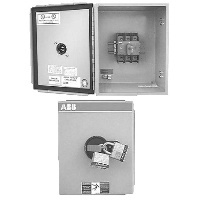 ECD has a large inventory ABB Disconnect Switches and Accessories in stock and ready to ship. Call ECD today for all your disconnect needs.